April 19, 2019 — JVS Human Services released a Request for Proposal with the primary objective of leasing professional office space (7,000-10,000 sq. ft.) to house Oakland County Michigan Works – North Oakland (Clarkston, Waterford Twp., White Lake Charter Twp., or Independence Charter Twp.). This annually renewed lease will begin July 1, 2019 and extend over a five-year period. All proposals are due electronically by 5/17/19 at 3:00 PM EST. Recruitment and sort center simulation in JVS Human Services facility in Detroit. Applicants must have an open case with Michigan Rehabilitation Services (MRS). Interested candidates are encouraged to contact their MRS counselor to be referred to the Sort Center Simulation Interview at JVS in Detroit, or contact Gabrielle Sharp by email at gsharp@jvshumanservices.org or phone 248.417.3094. In the future, positions will be available in Whole Foods, Prime Now and other Amazon warehouse locations in Ann Arbor, Detroit and Troy. Women in search of a fresh start and the tools it takes to successfully seek and secure employment after divorce, disability or death of a spouse, or other life circumstances will take center stage at the 11th annual JVS Human Services Trade Secrets fundraiser at 6 p.m. on April 11 at the Detroit Marriott Troy. Keynote speaker and honorary chair, Mindi Fynke, president and CEO of EHIM in Southfield, one of the largest woman-owned pharmacy benefits management companies in the country, will share her personal story of reinvention and success with the event’s expected 600 attendees. Through sponsorships, ticket sales and a signature raffle, the JVS Trade Secrets event raises funds for the award winning nonprofit’s Women to Work Program and other services that support women job seekers. The program has transformed the lives of more than 2,200 women throughout metropolitan Detroit for more than 30 years, with 85 percent of its graduates gaining employment or developing a plan to furthe their education. Luisa Harrington, a graduate of the Women to Work program, will share her inspiring story at the event. This year’s Trade Secrets event co-chairs are Roz Blanck, Kristen Gross and Linda Schlesinger-Wagner. Sponsorship opportunities are available; and individual tickets are $150. Visit www.jvshumanservices.org/tradesecrets or contact Judy Strongman at (248) 233-4213 for additional information. Trade Secrets’ Presenting Sponsor is EHIM; Platinum Sponsors include Jack and Annette Aronson, DeRoy Testamentary Foundation and Huntington Bank; and the Diamond Sponsor is Skinnytees. 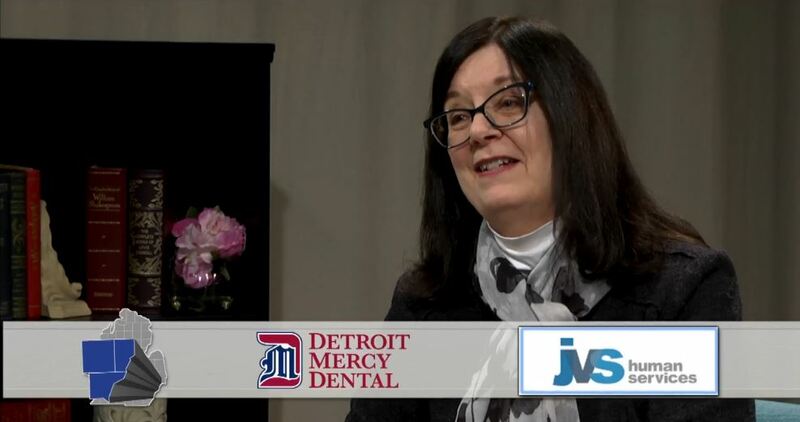 Karen Trompeter, director of JVS’s Tri-County Dental Health program, recently appeared on WBRW-TV with host Nannette Griffin talking about low-cost or no-cost services for underserved populations, emergency dental assistance and our co-teacher project with Detroit Mercy to enhance the clinical experiences of dental students in their work with people with disabilities. Southfield, Mich. (Jan. 2, 2019) – JVS Human Services will host a hiring blitz for direct care/engagement and job coach positions on Thursday, Jan. 10, 2019 from 2 to 6 p.m. at the JVS headquarters at 29699 Southfield Road, Southfield, Mich., 48076. There is help and hope for women facing difficult circumstances who need to return to the job market. JVS provides assistance to women from all social and economic backgrounds in Southeastern Michigan who must find a job following unemployment, divorce or the death or disability of a spouse or partner. In January, Springboard to Success combines computer training with JVS’s hallmark Women to Work program. Offered at no charge to participants, the program helps women assess their vocational interests, identify work-related skills, prepare resumes, develop interviewing and networking skills and launch a job search. It also includes hands-on Microsoft Office Suite 2010 training. Springboard to Success begins with an informational meeting at 9 a.m. on Jan. 10. The program starts on January 15 and will meet from 9 a.m. to noon on Tuesdays, Wednesdays and Thursdays at JVS Human Services in Southfield. For information or to register, contact Judy Richmond at jrichmond@jvshumanservices.org or (248) 233-4232, or visit www.jvsdet.org/women. JVS Human Services will offer a 10-week training program beginning January 8 in Southfield for individuals working in career development. The Facilitating Career Development Course is based upon 12 professional competency areas outlined by the National Career Development Association (NCDA). Led by nationally trained and certified instructor Karen Gutman, the class will offer hands-on, practical learning and interaction with colleagues from a variety of work settings. The program is designed for people who work in any type of career development positions including career counselors, job search trainers, career resource center coordinators, career coaches, career development case manager, school counselors, employment/placement specialists or workforce development staff. The class will meet from 6-9 p.m. on Tuesdays from Jan. 8 to Mar. 12 at JVS offices, 29699 Southfield Rd., Southfield. Tuition is $1,200 and includes all books and materials. For more information and to register, download the course flyer at http://bit.ly/FCD-Jan2019 or contact Karen Gutman at FCDGutman@jvshumanservices.org or 248-891-7484. A certificate of completion will be awarded to students who successfully complete course requirements. Participants will then be eligible to apply for the Global Career Development Facilitator (GCDF) credential offered by the Center for Credentialing and Education and the Certified Career Services Provider (CCSP) credential offered by the National Career Development Association. Flagstar Bank is partnering with eCycle Opportunities (ECO) to host a free electronic recycling event 9 a.m. to 1 p.m., Friday, Nov. 2, at Flagstar’s Troy headquarters. The event is open to Flagstar employees and the metro Detroit community at Flagstar Bank, 5151 Corporate Drive. Electronics such as TVs, computers, peripherals, flat screen monitors, cathode ray tubes (CRT) monitors, cable boxes, DVD players, cell phones and tablets will be accepted during the event, at no cost. The standard disposal fee of $25 on TVs will be waived for the first 400 TVs (limit two per vehicle), thanks to a generous grant from ITC Global. The event makes it easy for consumers to properly recycle—especially TVs and monitors—and builds awareness of the dangers of disposing electronics into landfills. According to Electronics Recycling Coordination Clearinghouse, Americans had around five billion pounds of CRT TVs tucked away in spare bedrooms and basements in 2015. Recycling electronics is often difficult or costly as they frequently contain toxic substances such as lead, mercury, beryllium, and cadmium. On average, legacy TVs with bulky and heavy CRTs contain around six pounds of lead. ECO provides services to businesses and organizations, including secure, certified repurposing or recycling of computers and other electronics, while at the same time creating jobs for individuals with disabilities and other barriers to employment. www.eCycleOpps.org. For more information about Flagstar Bank community initiatives, visit flagstar.com. The Dorothy and Peter Brown Jewish Community Adult Day Program (Brown Program) is hosting a dementia-friendly High Holiday service 11:00 a.m., Sunday, September 16 at Fleischman Residence/ Blumberg Plaza, 6710 W. Maple Rd., West Bloomfield, Mich., 48322. A luncheon will follow the service. There is no fee to attend. The dementia-friendly service will be an intimate gathering where individuals will feel welcomed and not overwhelmed by large crowds or a long program. The abbreviated 45-minute service will focus on the most important prayers. The service, named 2018 Program of the Year by the Association of Jewish Aging Services, also aims to help individuals with dementia tap into their memories as music and liturgy are usually among the last things to slip away. To register or for more information about the Yom Kippur service call (248) 661-6390. Individuals are encouraged to pre-register with the understanding that last-minute challenges may prevent them from attending. JVS’s electronics recycling division, eCycle Opportunities (ECO), has been awarded a $10,000 grant from ITC. ECO serves individuals and businesses by recycling their electronics in an environmentally responsible way. As part of its community-focused mission, ECO also provides jobs for people with disabilities and other barriers to employment. The grant will allow ECO to recycle televisions and CRT monitors at no cost to the public. ECO will offer the fee-free service at a special drop-off event in the fall and will continue the offer until grant funds are depleted. Responsible recyclers pay high fees to safely recycle televisions and CRTs, which contain harmful toxins such as lead and mercury. Those costs are usually passed along to consumers when the items are dropped off. ECO usually charges $25 for televisions, for example. The ITC grant will positively impact the community by keeping those harmful toxins out of landfills and preventing further contamination of the air, soil and water. “We are very excited about the grant because it gives us an opportunity to inform and educate the public while creating jobs,” said Lareau. Those interested in learning more can visit eCycleOpps.org or call 248-233-4477. With a grant from Bank of America, the JVS Bridging the Gap program is helping Detroiters who are experiencing homelessness successfully obtain employment to rebuild their lives. Watch this inspirational video on the impact this program had on Mark’s life.